At SKM we pride ourselves on being the best in the industry. From top-notch products, to unparalleled customer support, SKM offers each of our clients a true advantage. 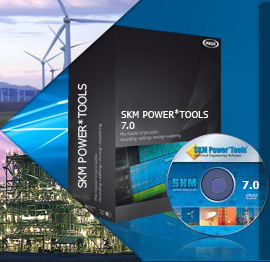 SKM has taken its power system design and analysis solution to new heights with PTW Version 7.0! DAPPER is an integrated set of modules for Three-Phase Power System Design and Analysis including rigorous load flow and voltage drop calculations, impact motor starting, traditional fault analysis, demand and design load analysis, feeder, raceway and transformer sizing, and panel, MCC, and switchboard schedule specification. 1. Generate better designs by comparing alternatives quickly. 2. Improve accuracy with DAPPER’s rigorous solution methods. 3. Save time by sharing a common project database and interface. 4. Improve consistency with standard design libraries. 5. Design safer systems by comparing calculations with short circuit and continuous ratings. 6. Communicate designs effectively with presentation quality graphics, reports, and equipment schedules. With DAPPER, users can calculate the voltage drop on each feeder and transformer branch, voltage on each bus, projected power flow, and losses in the power system. This program may be used for conventional voltage drop analysis, loss analysis, power factor studies, capacitor placement, long-line charging effects, impact loading for motor starting studies, generator sizing, and for cogeneration analysis. With DAPPER, a single load flow program models loop and radial power systems. Models radial, loop, and multiple independent systems. Models utility and generator equivalent impedance calculated from short circuit duty. Models up to 50 utilities/swing bus generators. Models up to 400 regulated and unregulated co-generators. User definable per unit driving voltage at each utility and swing bus generator. Models transformer primary and secondary taps and off nominal rated voltages. Full transmission line modeling with built in line parameter calculators. Models any combination of motor and non-motor loads with global and/or local load factors. Models any combination of constant kVA, constant impedance and constant current loads. Reports bus voltage, voltage angle, and voltage drop at each bus. Reports branch voltage drop, power flow in kW, kVAR, kVA, Amps and power factor. Reports branch loss in kW, kVAR, kVA, and total system losses. User definable report criteria for bus and branch voltage drops. Percentage voltage drops based on system voltage per ANSI standards. Double precision calculations improve solution accuracy. The DAPPER Comprehensive Fault Analysis program provides a network solution of three-phase, single-line to ground, line-to line, and double line to ground fault currents; RMS momentary fault currents; asymmetrical fault duties at three, five, and eight cycles; the positive, negative, and zero sequence impedance values between each fault location, and contributions from utilities, generators, and motors. At each fault location, the direction, X/R, and magnitude of fault currents are reported, thus providing a clear view of the conditions that exist during the fault. Symmetrical and Asymmetrical values reported at 1/2, 3, 5, and 8 cycles. Asymmetrical values reported at user selected fault time. Asymmetrical values reported as peak or RMS values. Models two and three winding transformer taps, phase shift, and off nominal rated voltages. Asymmetrical exponential DC decay is based on X/R to each contribution. Reports Thevenin equivalent impedance and X/R at the faulted bus. Detailed and summary reporting options. Reports bus voltages and branch flows throughout the system for each faulted bus. Reports phase or sequence current and voltage. Reports ground return current for double line to ground faults. Models transformer and generator neutral grounding impedances. Reports Connected, Demand, and Design loads. All load calculations account for individual load power factors. Automatically creates input load data for Load Flow and Voltage Drop Studies. Automatically creates loads for sizing feeders and transformers. System demand loads calculated using methods recognized by the NEC. Automatically tracks largest motor fed by each bus to meet NEC requirements. Automatic compliance with NEC and local codes for multi-level load diversity. Sensitivity studies, future load growth studies and load diversity studies by scaling load factors globally. “What if” analysis of loading conditions, i.e. light loading versus normal loading, or winter versus summer loading. Meet utility company requirements for providing a load summary by load type for connected, demand, and design loads at each utility bus. Generate sufficient information for sizing feeders, transformers, and other elements of the power system. DAPPER will size feeder cables, ground wires, raceways, bus ducts, duct banks and transformers throughout the power system to the load requirements calculated by the Demand Load Analysis program. Feeders are selected to meet user-defined criteria for conductor material, voltage level, insulation type, and environmental conditions. Transformer primary and secondary feeders are sized to the transformer full load as specified by the user. Feeders and transformers may be included, excluded or evaluated in the sizing study. AWG, Bus Duct, ACSR, or metric sizes may be used. Feeders and transformers with “Do Not Size” are evaluated for capacity. Feeder libraries permit user to include metric sizes and ampacity. Transformers can be sized to Demand or Design load. The DAPPER Load Schedule module provides detailed documentation of load fed through Panels, Motor Control Centers (MCCs) and Switchboards. Input is simplified through the use of libraries and copy and paste functions. The schedules can be displayed, printed, and exported in a variety of different formats. Schedules are automatically updated with available short circuit values and sub-feed totals. Switch board schedules are automatically generated from connected branch loads. MCC schedules can reference a default design library for automatic selection of feeder and raceway sizes, or the complete cable library for more detailed specification.